Until 1992, the territory of today's Czech Republic was part of Czechoslovakia (Československo). For airfields which are very close together, the label might be shown on the wrong side. The radio call sign was "ODKAPNIK". According to western signals intelligence (SIGINT), the range was also called "Navigacni Punkt 501" by the Czechoslovak Air Force. Doupov: Air-to-ground firing range for 11 SLP from Žatec. The call sign was "TEMPERA". The radio call sign was "TAXATOR". The radio call sign was "JILEC". 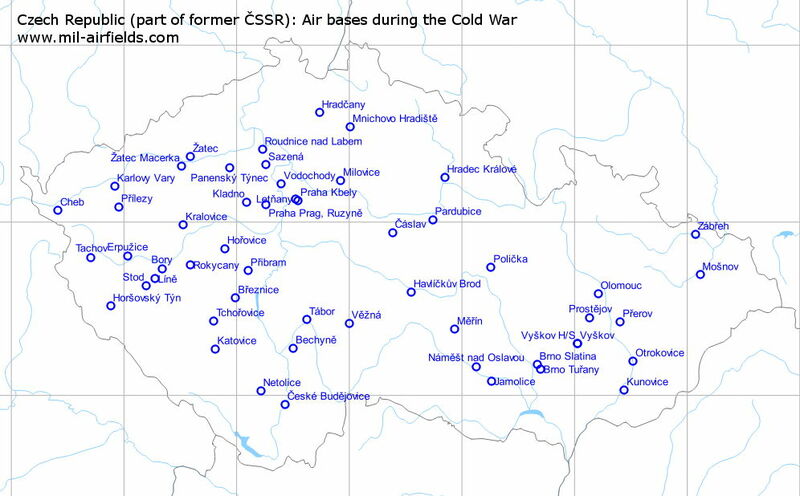 Detailed information about military objects in the Czech Republic, including airfields.